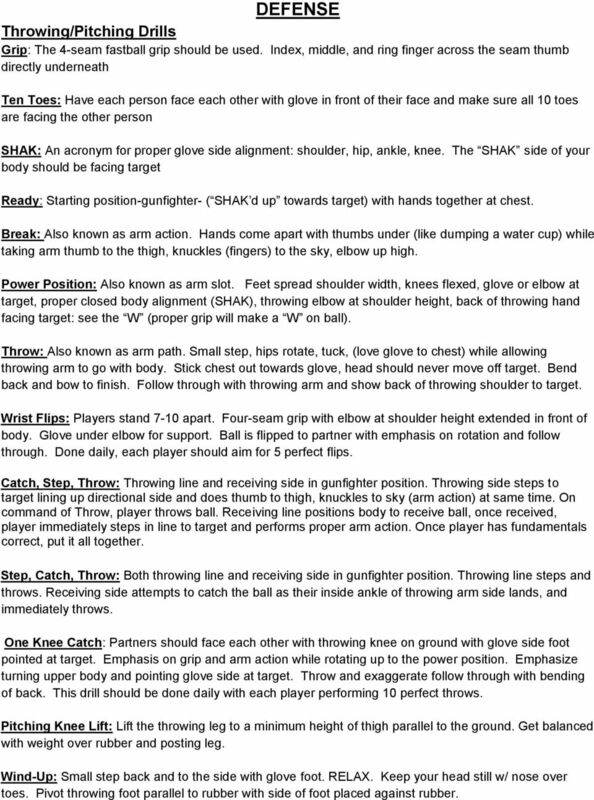 Download "DEFENSE Warm-Up Arm Warm up with starting light and gradually throw harder. Spend 5-15 minutes. OFFENSE"
2 DEFENSE Throwing/Pitching Drills Grip: The 4-seam fastball grip should be used. Index, middle, and ring finger across the seam thumb directly underneath Ten Toes: Have each person face each other with glove in front of their face and make sure all 10 toes are facing the other person SHAK: An acronym for proper glove side alignment: shoulder, hip, ankle, knee. The SHAK side of your body should be facing target Ready: Starting position-gunfighter- ( SHAK d up towards target) with hands together at chest. Break: Also known as arm action. Hands come apart with thumbs under (like dumping a water cup) while taking arm thumb to the thigh, knuckles (fingers) to the sky, elbow up high. Power Position: Also known as arm slot. Feet spread shoulder width, knees flexed, glove or elbow at target, proper closed body alignment (SHAK), throwing elbow at shoulder height, back of throwing hand facing target: see the W (proper grip will make a W on ball). Throw: Also known as arm path. Small step, hips rotate, tuck, (love glove to chest) while allowing throwing arm to go with body. Stick chest out towards glove, head should never move off target. Bend back and bow to finish. Follow through with throwing arm and show back of throwing shoulder to target. Wrist Flips: Players stand 7-10 apart. Four-seam grip with elbow at shoulder height extended in front of body. Glove under elbow for support. Ball is flipped to partner with emphasis on rotation and follow through. Done daily, each player should aim for 5 perfect flips. Catch, Step, Throw: Throwing line and receiving side in gunfighter position. Throwing side steps to target lining up directional side and does thumb to thigh, knuckles to sky (arm action) at same time. On command of Throw, player throws ball. Receiving line positions body to receive ball, once received, player immediately steps in line to target and performs proper arm action. Once player has fundamentals correct, put it all together. Step, Catch, Throw: Both throwing line and receiving side in gunfighter position. Throwing line steps and throws. Receiving side attempts to catch the ball as their inside ankle of throwing arm side lands, and immediately throws. One Knee Catch: Partners should face each other with throwing knee on ground with glove side foot pointed at target. Emphasis on grip and arm action while rotating up to the power position. Emphasize turning upper body and pointing glove side at target. Throw and exaggerate follow through with bending of back. This drill should be done daily with each player performing 10 perfect throws. Pitching Knee Lift: Lift the throwing leg to a minimum height of thigh parallel to the ground. Get balanced with weight over rubber and posting leg. Wind-Up: Small step back and to the side with glove foot. RELAX. Keep your head still w/ nose over toes. Pivot throwing foot parallel to rubber with side of foot placed against rubber. 3 Fielding Drills Ground Balls on Knees: Roll ball back and forth to control with two hands with glove. Ground Balls Standing: Standing with partner close together roll ball back and forth for control. Forehand Play: We must get the front shoulder on the target on this play to keep the ball from sailing away from the target. Backhand Play: You must make sure that you are bending at the knees, instead of straight down at the waist. You want to keep your eyes as close to the glove as you can. Angle Drill: Players start in single file line, each with a ball. The first player in line will give their ball to the coach. Coach then points in a direction. Player uses proper footwork (drop step, crossover) to initiate pursuit. The player should not look for the ball until coach yells ball. The player locates the ball and continues to sprint to the spot of landing for the catch. 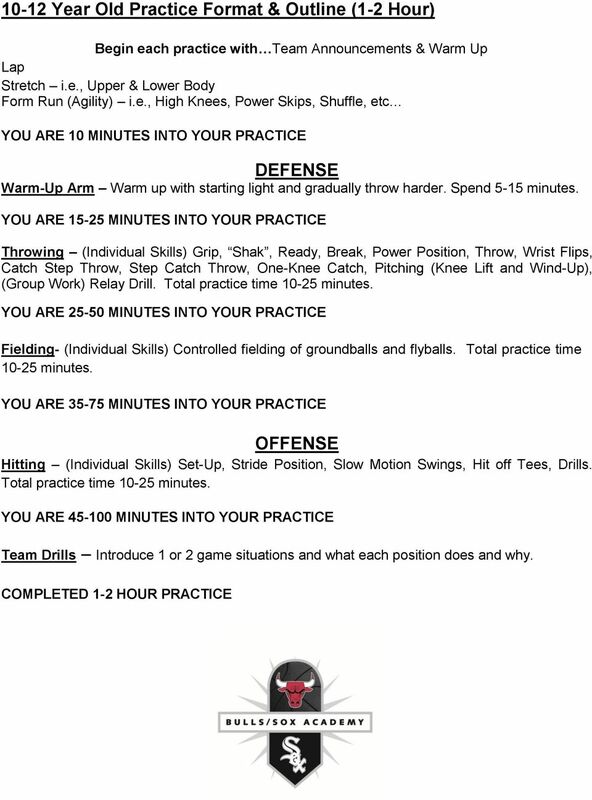 This drill can be used for practicing ground balls, line drives and fly balls. Outfield Weave Start the drill w/ three groups, one in left field, one in center field, and one group in right. Have the coach near 2nd base w/ fungo. First player in each line prepares to receive fly ball. Coach hits fly ball between left and center field. Left fielder moves to catch ball and center fielder backs up play. Left fielder catches ball and throws ball into 2nd base. Left fielder and center fielder switch groups. Then coach will hit it to Right and do the same thing. Relay Drill: Line-up a minimum of three players about 5-10 feet apart. Ball is thrown down the line to each player. OFFENSE Hitting Drills Set-Up: Stance: Feet parallel, toes pointed straight, weight on inner balls of feet, knees inside feet, grip: knocking knuckles lined up, back elbow half way up, front shoulder on pitcher, head upright eyes level, hands held on top of strike zone. Stride Position: Stride: Step to pitcher, front toe still pointing to home plate, weight is at a 50/50. Slow Motion Swings: Any new mechanical idea or adjustment should be executed correctly in a slow motion dry swing so that the hitter can feel the proper movement. Standard Tee Work: Emphasis on stride alignment and not over stepping the ball and tee. Early Stride-Separation: Front or side flips, short pitch or batting practice where the hitter goes through their weight transfer back and stride separation then pauses in a strong launch position before the ball is flipped. The purpose of this drill is to show the hitter this is their strongest hitting position and this is where they should be when they take a pitch. Whiffle Ball Front Toss: Multiple lines at one time for more repetitions. Coaches toss the balls so players can practice consistent swing. 4 Step In Drill: The hitter will be in their normal set-up but just with an open stance. They will have the bat on the shoulder and when the stride foot advances forward the hands take the bat to the proper launch position. Forced Hand Movement: Hitter begins from their normal stance except the hands are placed in front of the face with the bat vertical. The idea is to show the hitter the back movement as the stride foot advances forward. The hand set up position makes the hitter have to move their hands to get to the proper position. The desired bat angle when the foot hits will be approximately 45-degree angle with the end of the bat over the head. This drill can be done using the tee, soft toss, short pitch and regular distance. Walk Thru Drill: This drill will allow the hitter to work on all the absolute from the start of the swing until the finish. Hitter gets in their set-up with feet approximately 6 to 8 apart, bat on the shoulder and the arms relaxed with the knob of the bat pointed at the instructor. The 1st step is a small crossover with the back foot across parallel to the front foot. As crossover occurs with slight shoulder turn, the knob of the bat is pointed at the instructor. As the foot comes forward with the stride, the hands take the bat off the shoulder to get the bat to the launch position as the hitter rides the back leg before they swing. The hitter must focus on riding his back leg properly to get pitch recognition and control the weight instead of rushing to the front side. 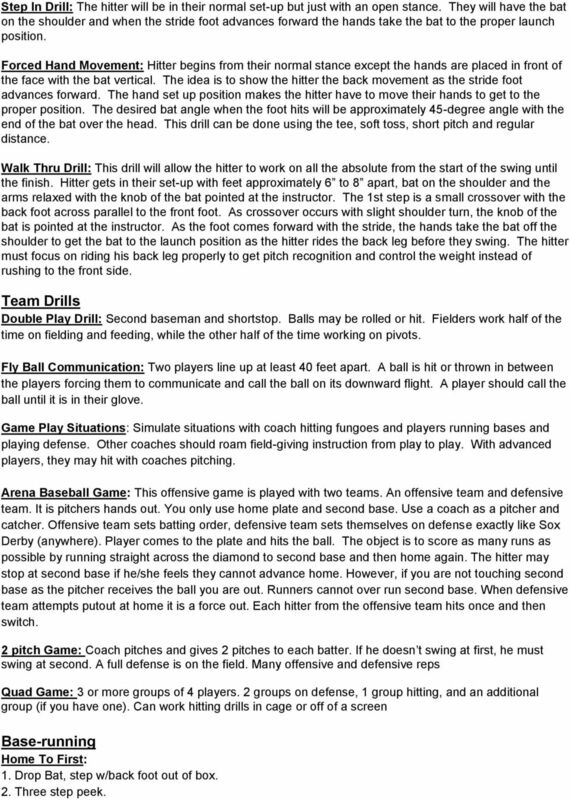 Team Drills Double Play Drill: Second baseman and shortstop. Balls may be rolled or hit. Fielders work half of the time on fielding and feeding, while the other half of the time working on pivots. Fly Ball Communication: Two players line up at least 40 feet apart. A ball is hit or thrown in between the players forcing them to communicate and call the ball on its downward flight. A player should call the ball until it is in their glove. 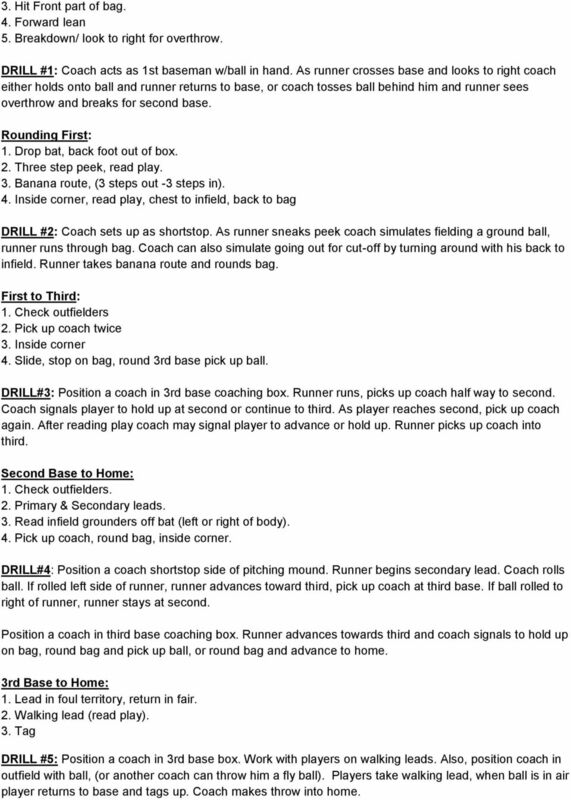 Game Play Situations: Simulate situations with coach hitting fungoes and players running bases and playing defense. Other coaches should roam field-giving instruction from play to play. With advanced players, they may hit with coaches pitching. Arena Baseball Game: This offensive game is played with two teams. An offensive team and defensive team. It is pitchers hands out. You only use home plate and second base. Use a coach as a pitcher and catcher. Offensive team sets batting order, defensive team sets themselves on defense exactly like Sox Derby (anywhere). Player comes to the plate and hits the ball. The object is to score as many runs as possible by running straight across the diamond to second base and then home again. The hitter may stop at second base if he/she feels they cannot advance home. However, if you are not touching second base as the pitcher receives the ball you are out. Runners cannot over run second base. When defensive team attempts putout at home it is a force out. Each hitter from the offensive team hits once and then switch. 2 pitch Game: Coach pitches and gives 2 pitches to each batter. If he doesn t swing at first, he must swing at second. A full defense is on the field. Many offensive and defensive reps Quad Game: 3 or more groups of 4 players. 2 groups on defense, 1 group hitting, and an additional group (if you have one). Can work hitting drills in cage or off of a screen Base-running Home To First: 1. Drop Bat, step w/back foot out of box. 2. Three step peek. 5 3. Hit Front part of bag. 4. Forward lean 5. Breakdown/ look to right for overthrow. DRILL #1: Coach acts as 1st baseman w/ball in hand. As runner crosses base and looks to right coach either holds onto ball and runner returns to base, or coach tosses ball behind him and runner sees overthrow and breaks for second base. Rounding First: 1. Drop bat, back foot out of box. 2. Three step peek, read play. 3. Banana route, (3 steps out -3 steps in). 4. Inside corner, read play, chest to infield, back to bag DRILL #2: Coach sets up as shortstop. As runner sneaks peek coach simulates fielding a ground ball, runner runs through bag. Coach can also simulate going out for cut-off by turning around with his back to infield. Runner takes banana route and rounds bag. First to Third: 1. Check outfielders 2. Pick up coach twice 3. Inside corner 4. Slide, stop on bag, round 3rd base pick up ball. DRILL#3: Position a coach in 3rd base coaching box. Runner runs, picks up coach half way to second. Coach signals player to hold up at second or continue to third. As player reaches second, pick up coach again. After reading play coach may signal player to advance or hold up. Runner picks up coach into third. Second Base to Home: 1. Check outfielders. 2. Primary & Secondary leads. 3. 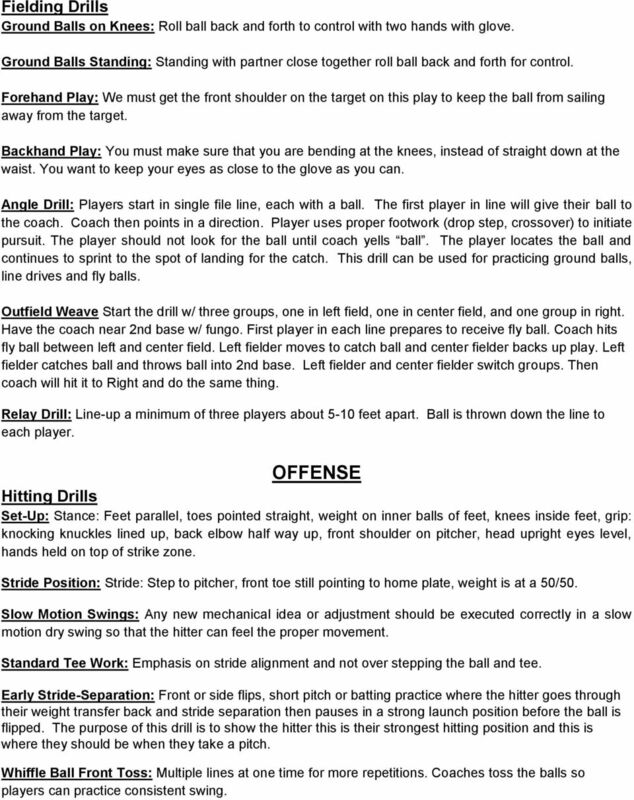 Read infield grounders off bat (left or right of body). 4. Pick up coach, round bag, inside corner. DRILL#4: Position a coach shortstop side of pitching mound. Runner begins secondary lead. Coach rolls ball. If rolled left side of runner, runner advances toward third, pick up coach at third base. If ball rolled to right of runner, runner stays at second. Position a coach in third base coaching box. Runner advances towards third and coach signals to hold up on bag, round bag and pick up ball, or round bag and advance to home. 3rd Base to Home: 1. Lead in foul territory, return in fair. 2. Walking lead (read play). 3. Tag DRILL #5: Position a coach in 3rd base box. Work with players on walking leads. Also, position coach in outfield with ball, (or another coach can throw him a fly ball). Players take walking lead, when ball is in air player returns to base and tags up. Coach makes throw into home. Official Softball Rules Revision Date 5/5/2015 (newest rules highlighted) Unless otherwise stated, ASA rules govern this league. Official Softball Rules Revision Date 5/5/2015 (newest rules highlighted) Unless otherwise stated, ASA rules govern this league. GAME REGULATION: Game time is start time, 10 minutes after last game ended. It's time once again to relive those nostalgic days of gym class, and get your kickball team together! Get outside and get some fresh air, all while being able to throw a kickball at the opposing team.